Derry City manager, Kenny Shiels. THE FAI has confirmed Derry City's SSE Airtricity League fixtures against both Dundalk and Cork City have been postponed due to international call-ups. 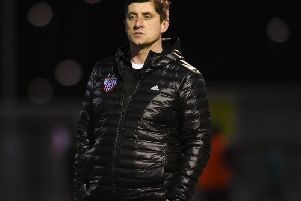 The Candy Stripes were pencilled in to play their re-arranged league clash with Dundalk at Brandywell Stadium next Monday, March 19th before travelling to Cork the following Friday, March 23rd. However, given a host of Derry City’s first team panel have been called up for international duty that week, those games have been rescheduled with Derry now set to play Dundalk at Brandywell Stadium on Monday, May 14th (kick-off 7.45p.m.). Kenny Shiels' troops will then travel to Cork on Monday, June 4th with a kick-off time to be confirmed. Conor McDermott, Jamie McDonagh and Ben Doherty have been selected for Northern Ireland U21’s UEFA Euro U21 double header against Spain and Iceland while Eoin Toal is expected to be in action for the U19s. And Rory Hale and Ronan Curtis will be involved in Noel King’s Republic of Ireland U21 home Euro qualifier against Azerbaijan while hat-trick hero from Monday night's successful Brandywell homecoming, Ronan Hale is expected to be involved in the U19 panel.